Amb. Godknows Igali cutting the tape to declare open the NWRCBNet-SW Building while being assisted by a Council member, Mrs. Obioma Ezeozue (2nd Right) and the VC, Prof. Olusola Oyewole (2nd Left). The Federal Government has described as erroneous, the impression in certain quarters, that the 2015 bench mark for the actualisation of the Millennium Development Goals (MDGs) in the country was a mirage. The Permanent Secretary, Federal Ministry of Water Resources, Ambassador Godknows Bolade Igali, who made the observation, declared that “meeting the challenge of the Millennium Development Goals in 2015 is not impossible”. Baring government’s mind after commissioning the building of the National Water Resources’ Capacity Building Network, Southwest Centre (NWRCBNet-SW), located in the Federal University of Agriculture, Abeokuta (FUNAAB), Amb.Igali affirmed that “if all actors could team up and join hands with the Federal Government, the 2015 MDGs will be a non-issue and foregone conclusion”. On the MDGs objective of providing water, good sanitation and food security, he said it was a daunting task that must be accomplished in order to save the nation from further degradation. Ambassador Igali pointed out that the Federal Government could not afford folding its arms, watching an unpleasant situation, whereby only 58 per cent of the 178 million Nigerians have access to clean water and over 80 million Nigerians denied of the basic need of life. Speaking further, the Permanent Secretary said, “It is worse for sanitation. Only 32 per cent of Nigerians have access to good sanitation. There is still open defecation everywhere”. Dr. Igali reiterated the commitment of President Goodluck Jonathan to addressing the anomalies, pointing out that government cannot do it alone, therefore soliciting the genuine and concerted efforts of all stakeholders. “I’m not here to flatter you, the truth must be told. For us to meet the MDGs, there is the need for us to work together. President Goodluck Jonathan cannot do it alone. Meeting the challenges of MDGs is not impossible if all actors can team up; we can realize the 75 per cent target for water supply and others by 2015”, he added. Ambassador Igali described the commissioning of NWRCBNet-SW Building as a bold step in the President Jonathan’s Transformation Agenda, aimed at boosting the supply of potable water and irrigation farming in Nigeria. Dr. Igali said government is now collaborating with relevant stakeholders like FUNAAB in the area of irrigation farming so as to make it possible to have steady food supply throughout the year. 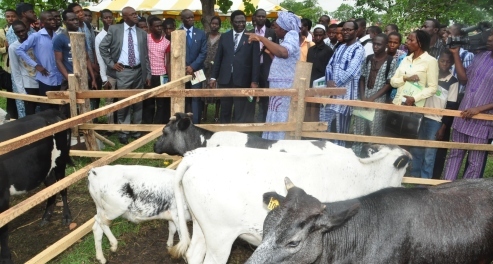 The Permanent Secretary pointed out that with the commissioning, FUNAAB had now assumed fully, the responsibilities of a Centre of Excellence, capable of engaging in research and demand-driven training and education in Integrated Water Resources Management, while also serving as the breeding ground for the required manpower for Water Resources Development. Ambassador Igali disclosed that in due course, the NWRCBNet-SW/FUNAAB will commence Postgraduate Diploma and M.Sc courses in Integrated Water Resources Management, Sanitation and Hygiene Promotion, Water Quality Management as well as Irrigation and Drainage Technology. According to him, other courses that will be run through the Centre include Dam and Resources Management, Hydrogeology and Drilling Technology, as well as Rural Watershed Sedimentation Hydraulics. He revealed that FUNAAB was selected as the NWRCBNet Centre for the Southwest adding that other Centres are the Ahmadu Bello University, Zaria (North-West), University of Maiduguri (North-East) and University of Ilorin (North-Central). Others are the Nnamdi Azikwe University, Awka (South-East) and University of Calabar (South-South). Dr. Igali disclosed that about N15.9 million had been appropriated in 2012 for the Network, to carry out research on Drinking Water Quality Assessment in Imo State in the South-East. The Permanent Secretary commended the Vice-Chancellor, Professor Olusola Bandele Oyewole and his team for a good job of high infrastructural development in the University. Ambassador Igali was accompanied on the trip by the Executive Director, National Water Resources’ Institute (NWRI), Kaduna, Dr. Olusayo Bamgboye and the Director, Special Duties, Federal Ministry of Water Resources, Mr. Olufemi Odumosu. Others were the Acting Director, Training, NWRI, Mr. O. O. Ohi and Assistant Director, Human Resources, Federal Ministry of Water Resources, Abuja, Mr. Chuks Mbaike, among others. The University’s Vice-Chancellor, Council Members, Principal Officers, Deans and Directors as well as the Managing Director, Ogun-Oshun River Basin Development Authority (OORBDA), Engr. Jimi Omoliki, were some of the dignitaries present at the occasion.